Services for International Students and Scholars within Global Affairs is learning about an increase in the number of scams targeting international students and scholars. While at UC Davis, we hope that you will never be contacted by someone attempting to "scam" or defraud you of your money. Unfortunately, as is true anywhere in the world, there are people who attempt to take advantage of international students and scholars. With a little knowledge, you can learn how to identify a scam and avoid falling victim to the scheme. This page has general information about a variety of scams you may encounter, how to prevent them, and how to report them. Scams are dishonest, illegal schemes to make money. There are several ways that people try and defraud, like a phone call from a stranger posing as a government official or law enforcement, a potential employer or landlord asking for personal and financial information before ever meeting you, or emails from unknown addresses requesting information urgently. Below are descriptions of some of the most common scams students and scholars encounter—learn how to recognize the signs and protect yourself. Beware of phone calls from strangers claiming to be government or law enforcement officials. These people can make it look like they are calling from a legitimate phone number. Scammers might demand you send money or gift cards immediately, and threaten arrest or deportation if this is not done right away. Scammers create rental ads with real or fake information about homes or apartments that have been previously listed for rent or sale. The “owner” or “landlord” will often email the prospective renter claiming they are out of town for a job or overseas for missionary work and avoid responding to detailed questions about the property. Despite attempts to see the property, the scammer will explain that the home must rent without being seen due to their current long-distance living situation. Rental scammers will try to include a lot of unnecessary detail to appear legitimate to prospects. They will mention lawyers or agents and added security measures, like address verification, to build trust and authority with their victim. At the same time, they remain vague and distant about property specifics or reasons for not accepting alternative forms of payment. They might request wire transfers through companies like Western Union or MoneyGram, which are untraceable and non-refundable. This is a huge warning sign. Scammers may also try to get your sensitive information through email. This is called “phishing.” Phishing is “the activity of defrauding an online account holder of financial information by posing as a legitimate company.” Some scams use websites that may look legitimate to capture personal or financial information. These false websites could use a recognizable business of organization's name or logo, but the URL will be unfamiliar, or will not begin with https:// which keeps your information secure from hackers. Phishing emails usually come from strangers and can feature a vague subject line, or request personal information with unnecessary urgency. 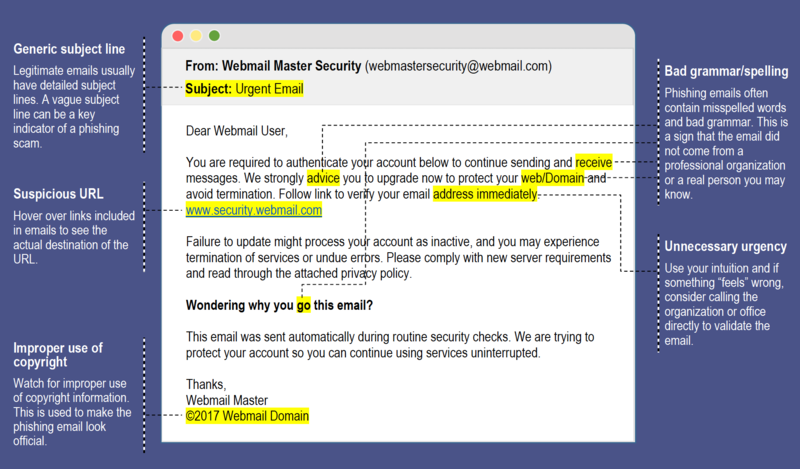 See the example below to identify characteristics of a phishing email. Did someone promise you a job if you pay them? Never pay anyone who promises you a job, a certificate that will get you a job, or secret access to jobs. These are scams. Did the IRS, Homeland Security, District Attorney's Office, FBI, Immigration, State Police or other "official" agency telephone saying you owe money? These agencies NEVER call to ask for money. Government agencies do not call to threaten you or ask for money. Are you or have you entered the Diversity Visa Lottery to get a green card? The lottery is free to apply and the choice is random. No one can increase your chance of winning. Are you looking for legal help with immigration? Use a lawyer or an accredited representative, never a notary public (notario). Did you get a call or email saying you won something, (except there is a fee)? Never pay for a prize. That is a scam. You will lose your money. Did a caller offer to help you get back some money you lost? No government agency or legitimate business will call and demand money to help you get money back. Did you get a check from someone who asked you to give them part of t he money back? Never give someone money in return for a check. Fake checks can look real and fool the bank. When it is discovered to be fake, you will have to pay back ALL the money. Did you get an email, text, or telephone call asking for your credit card, bank account, or Social Security number? Never give that information to anyone who asks over email, text or telephone. It is free to apply and the choice is random. No one can increase your chance of winning. Did someone call you to tell you they need to fix your computer remotely, but need you to log in? Don't believe it. Do not give them any personal information or help them log on to your computer.